Two Banbury men have been convicted of causing the death of an elderly woman in a crash while going the wrong way down a dual carriageway during a chase. Sagar Taseem and Naqash Hussain had both denied causing the death of Elizabeth Roberts, 80, from Broughton, by dangerous driving. But after deliberating for just over five hours, the jury at Warwick Crown Court found both men guilty yesterday (Monday, February 4). Following the jury’s verdicts, sentencing of Taseem and Hussain was adjourned until today (Tuesday). The jury rejected Taseem and Hussain’s version of the tragic events which unfolded on the B4451 near Gaydon in February 2017, claiming they were being chased and feared for their safety. 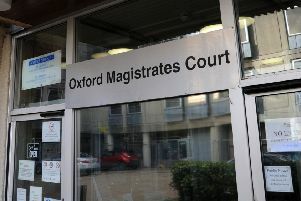 The court had heard that in fact it was Taseem, 26, of Evenlode, Banbury, driving a BMW, and his passenger Hussain, 29, of Prescott Avenue, Banbury, who had been chasing a Ford Fiesta. That was being driven by Kieran Flint, 21, of Barley Hill, Banbury, who was also in the dock, having denied a charge of dangerous driving over his actions earlier in the incident. But despite Flint conceding when questioned by the judge that his driving had been dangerous, the jury convicted him of the alternative offence of careless driving. It was there that Franklin, 24, of Warkworth Close, Banbury, rammed the back of the BMW, after which Taseem sped the wrong way back down the dual carriageway. Franklin will be joining Taseem and Hussain in the dock as, although he was not involved in the actual crash, he admitted causing death by dangerous driving before the trial. Addressing Flint’s barrister, Anthony Cartin, the judge remarked: “The problem your client created in this was calling in his friend, but that’s not careless driving.